Virginia Woolf once said we all need a room of our own. where thieves do not break through nor steal." someplace that feels like Home. at the foot of a mountain . . .
dancing in the darkening stillness. 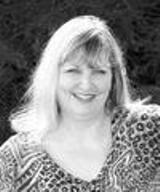 Jayne Jaudon Ferrer is the author of four books of poetry that focus on family life, including the now classic A New Mother’s Prayers, which has remained in print for more than twenty years. An award-winning copywriter and freelance journalist earlier in her writing career, Ferrer is a native Floridian who now lives in Greenville, South Carolina. She speaks frequently at women’s and book events and her work has appeared in numerous publications ranging from Boca Raton Magazine to Christian Parenting Today. Learn more about her at www.jaynejaudonferrer.com. Autographed copies can be ordered at www.magnoliatrappings.com. I love the shape and pace of this poem. Actually I didn't notice how long it was until I had finished reading it. The 'firefly light show' was the star attraction for me. Thank you! LOVE IT!!! It is sad when a place that gives us that feeling of being refreshed is only in our memory. It is important to make or find NEW places called home as we move through life!! THANKS Va.
How wonderful, Jayne. I got to see the lightning bugs of North Carolina a few weeks back. Magnificent! So is your poem! I love it, Jayne! "but we worry less...if we know there's a place you call Home in your heart." Amen!